A business executive sits at a desk, reading a newspaper. An evil angel walks in the door, and muses to them self, rubbing their hands. There's a big difference between a good father and a great father. 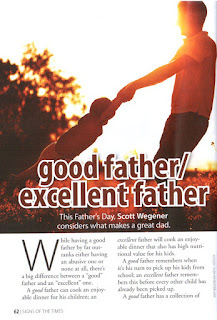 While having a good father by far out ranks either having an abusive father or none at all, you may be surprised to hear there's somewhat a big difference between a good dad and a great one. A good father can cook an enjoyable dinner for his kids. A great father can cook an enjoyable dinner that has some sort of nutritional value for his kids. A good father remembers when it's his turn to pick up his kids from school. A great father remembers before every other child has already been picked up.